You don’t need me to tell you how crazy this time of year is. 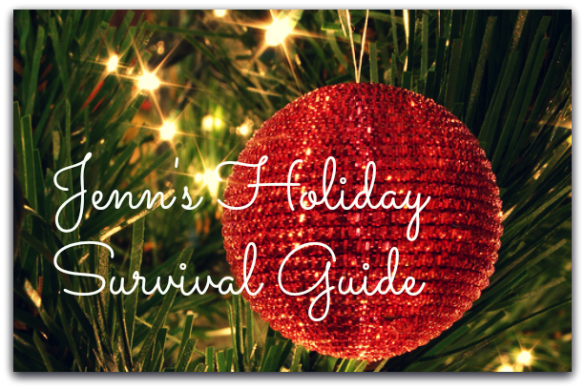 Between holiday parties, family gatherings and gift exchanges, it’s easy to get overwhelmed. Okay, I’ll admit it: I’m overwhelmed. No matter how many times I promise that I’ll have my Christmas shopping checked off my to-do list before Black Friday, I usually have a number of gifts left to find the week before Christmas. Fitting in workouts this time of year is hard, too. My usual 45-minute to 60-minute sweat sessions have been replaced by 20 minutes here and there when I can, and usually in the morning because it’s the only time that it gets done. There are just not enough hours in the day. Most years, I freak out about gaining weight right before Christmas. So now. I freak out now. Between the eggnog (I go for the soy milk version, but it’s still chock full of sugar), the cookies and the numerous potlucks at my day job, it’s almost impossible not to splurge. Pair those splurges with less activity and you have a recipe for a few more pounds. I’m not freaking out this year. I’m carefully picking my splurges (pass on the cheesy rice casserole, hit up the gingerbread men), limiting my wine consumption (tough, but worth it to savor a glass instead of downing three and almost falling asleep on the dance floor) and taking any activity I can—including enthusiastically cleaning my toilets and hardwood floors. Okay, maybe not enthusiastically, but cleaning is no joke. You get your scrub on, and you get your calorie burn on. And even if I gain a pound or two, who the heck cares? Fit bottoms come in all sizes, and, like most years, I bounce back pretty quickly in January by getting back to my usual food consumption and regular workouts. So there’s my plan. I shall indulge wisely, do something active most days of the week and be easy on myself. Actually, that sounds like a good plan for any time of year, huh? If you’re looking for more musings from the FBGs, check out Jenn’s thoughts on McDonald’s and Erin’s desire to be a morning person. Photo grabbed from krisdecurtis at Flickr. Great honest post. Good luck with your to dos and Merry Christmas!! I’m enjoying it. Not with “abandon” so to speak, but I’m enjoying it and not letting myself feel deprived. It’s scientifically proven that calories don’t exist between Thanksgiving and January 2nd. It’s true! They are replaced with happiness and who wants to burn off happiness? So sayeth Dr. Happypants MacGuire, M.D, Ph.D., at your service. You have such a good attitude toward it. In past years, I may have done the whole “I’m off-track-anyway-freak-out-and-go-crazy-and-eat-myself-sick” approach. This year I’ll try the “pick my splurges and enjoy them!” approach. And maybe even get some much-needed cleaning in! I am always encouraged by this blog and have to date lost 31 with equal number to go. November and December are hard. I’m getting in some bike riding with my Dad this week as I’ll be where it is warm! And I park far away when shopping and grocery shopping. And I carry a little basket and make more trips to the grocery store. Every bit helps!